Bank notes are known for their various security features. Most notes include the heavy use of intaglio printing where the design is composed of complicated patterns of fine lines. Inkscape has many features that allow one to design attractive bank notes complete with a variety of security features. In this tutorial, we explore some of the tricks while creating a “50 Inkies” bank note. The bank note is composed of a variety of different types of objects. Most of these objects are independent of each other. 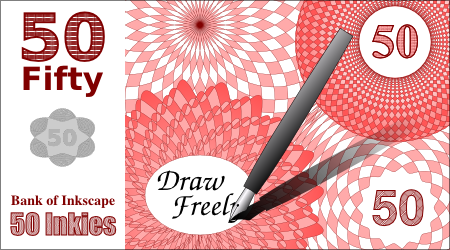 Unlike the other tutorials, there is no natural order in creating the drawing. Just pick and choose which features you want and how and where they are placed. A 50 Inkies bank note. The full tutorial can be found in the print and PDF versions of the book. For more information, check the book's website.